Turn a ramshackle barn into a cozy and warm winter home. "I love this game. 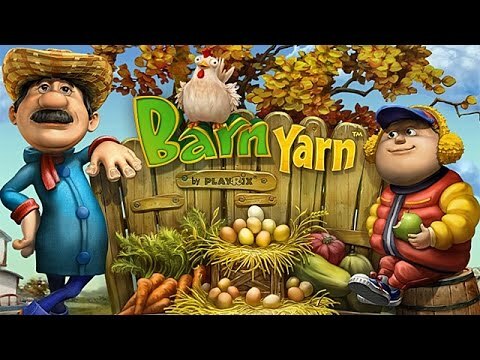 It's similar to Gardenscapes except instead of creating a garden, you're designing the inside of a barn." Reconnect with Joe and Tom as you help them repair an old barn purchased from a neighbor and prepare for the harsh winter. Sell off old things found around the house and purchase everything you might need to turn the ramshackle barn into a cozy and warm winter home for the farm animals. By the way, Joe has a dream. Do you think you could help him make it come true? Hello again Uncle Joe. This is the ultimate kind of Hidden Object game. I love it because you can earn money and then use it to renovate. Fantastic. I really enjoy this game -- the furnishing options are great. Joe and his grandson are really fun to interact with. The hidden objects are fun to find and not too stressing. I don't like being rushed when I play a game. I like to take my time and enjoy it. Playrix Games are the best! I love Barn Yarn! The game makes your brain work without being too taxing. Thoroughly enjoyable. I would like to see more games like this. This game is addicting. Once you start, you feel compelled to get Joe his tractor. Lots of things to see and do.